Aims to assess the trainee's ability to obtain obstetric and gynaecological histories, to counsel patients and to demonstrate clinical skills. This book helps the candidate to appraise pieces of written work in discussion with examiners and to discuss the varied aspects of obstetrics, gynaecology and allied subjects. 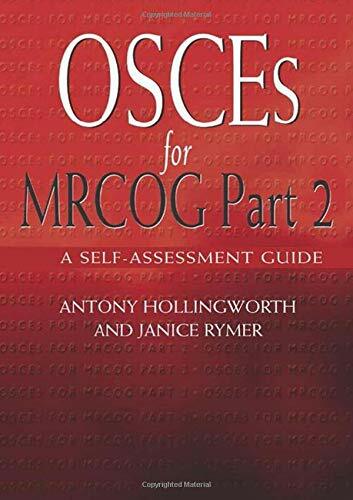 This book is designed to help the candidate in preparation for the oral examination or OSCE, the concluding element required to pass the MRCOG part 2 examination. Concentrating on testing the candidate's practical knowledge and theory application of obstetrics and gynaecology as recommended in the syllabus for the MRCOG Part 2 examination, the book will assess the trainee's ability to obtain obstetric and gynaecological histories, to counsel patients and to demonstrate clinical skills. It will also help the candidate to appraise critically pieces of written work in discussion with examiners and to discuss the varied aspects of obstetrics, gynaecology and allied subjects on which they are likely to be examined during the oral assessment. Opening with a general introduction to the OSCE, the book gives readers some general advice on preparation for this particular form of examination such as body language, the importance of visual contact and how to interact appropriately with the examiner and the 'role player'. Helpful discussion sections at the end of each case or 'station' provide useful suggestions for further study, and are supplemented by key references. Additional circuits with less detailed information are also provided for examination practice.